At Immaculate Inning we like to split our coverage between baseball and Duke athletics. With the 2008 Olympics starting tonight, we'd like to take the time to wish good luck to the former and current Duke athletes competing in Bejing, along with a brief preview of their chances for gold. Rebecca Ward, Fencing-- named to the Olympic team back in May, Ward is ranked #1 in the US and #2 in the world in Women's Saber. The Americans come into the games ranked very highly in the world. Ward, 18, will be a freshman at Duke in the fall, and may come to Durham with a gold medal already in her trophy case. 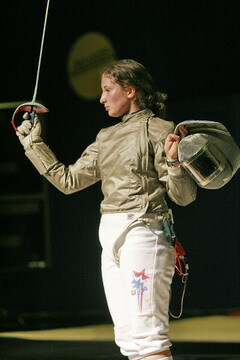 Ward defeated defending saber champion Mariel Zagunis in the 2006 World Fencing Championships. Most of her competition for the gold will come from her own team, including the #1 player, Sada Jacobson. Gold Medal Odds: 3 to 1. UPDATE: The Women's individual sabre competition was held today, and the US swept the medals. Rebecca Ward fell to Mariel Zagunis in the semifinals but came away with the bronze. She still has a chance at gold in the team sabre competition, and with the US performance in the individual competition, it looks like inevitable. Congratulations, Rebecca! Rebecca Smith, Soccer-- Playing for New Zealand, Smith is a defender who played for Duke in 1999-2002. In their Olympic Opener, 24th ranked New Zealand played 10th ranked Japan to a 2-2 tie in Group G, and Smith played all 90 minutes. The battle to the medal round will be much tougher, as Group G also includes fifth ranked Norway and the tourney favorite, USA. The 27-year old Smith was born in the US, the neice of a former New Zealand men's national team player. Her parents brought her to California but she has remained a solid kiwi since. Gold Medal Odds: 50 to 1. Shannon Rowbury, Track & Field-- We have already profiled the 23-year old distance runner, but what are her chances at Olympic gold? Good news came from Russia at the end of July, as the entire Russian middle-distance team was suspended for doping offenses. Rowbury faces tough veteran competition. Ethiopian Burka Gelete has a personal best a few seconds better than Rowbury's, but that was acheived three years ago (she has run another sub-four minute mark indoors this year). Bahraini runner Maryam Yusuf Jamal won the gold medal at the 2007 world championships and has a personal best of 3:56; she also caused a controversy in her home country for wearing shorts and baring her mid-riff during a race. Romanian Liliana Popescu will also make the competition tight, as her times match well with Rowbury's. It will be an exciting race if Shannon can make the finals. Gold Medal Odds: 10 to 1. Carlos Boozer, Basketball-- Everyone's familiar with the lone former Blue Devil on Coach K's Dream Team squad. The team is built around the speed of Kobe Bryant, LeBron James, and Carmello Anthony, which has pushed Boozer to the bench behind starting forward Dwight Howard. Still, the depth of the US roster should allow them to run circles around most of the teams. Familiar international foes Spain and Germany will make the road back to the top tough for the US, but it's certainly possible that Boozer will be the first Dukie to take home a basketball gold medal since Christian Laetner in 1992. Gold Medal Odds: 5 to 1.